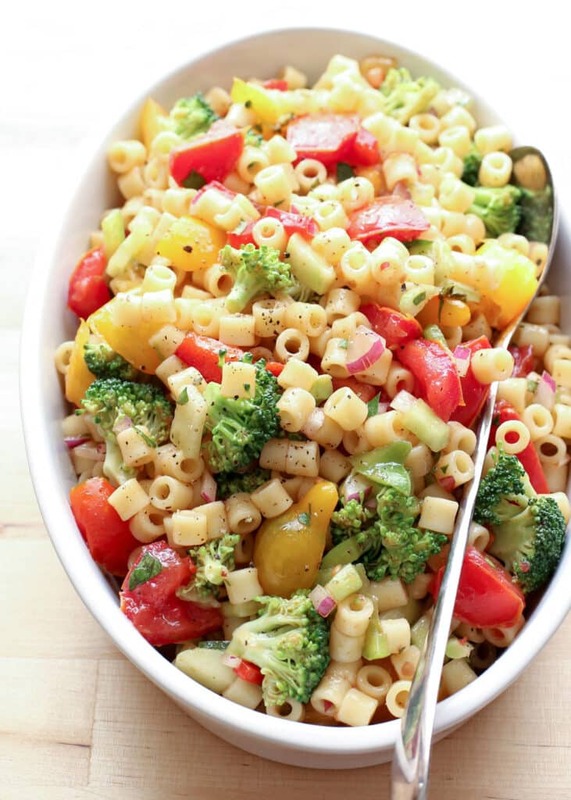 What brings to mind spring picnics and summer potlucks like a tasty pasta salad? Whether you’re a fan of creamy pasta salads, vinegar-based (mayo-free) pasta salads, meat lovers pasta salads, or vegetarian and vegan pasta salads, there’s something here for everyone! I love being able to experiment with different combinations of pasta, vegetables, cheeses, and meats to create a delicious dish that’s perfect for sharing. 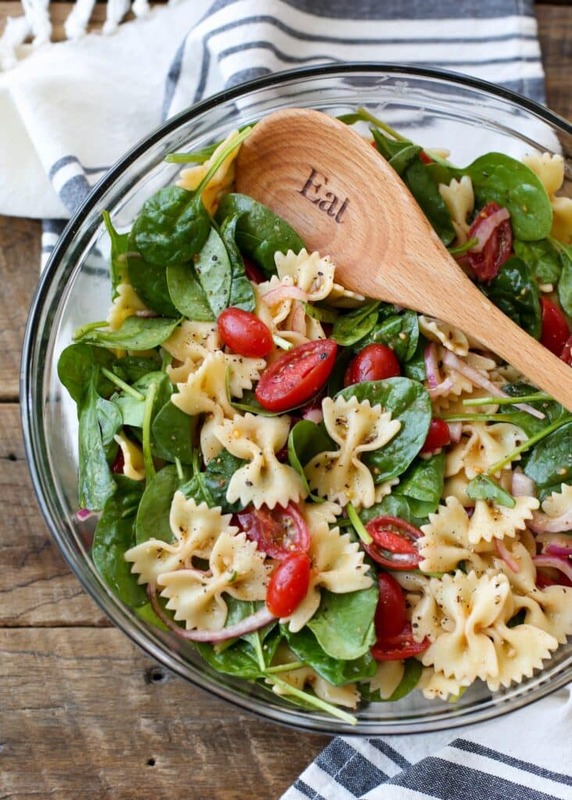 Almost every family has a favorite go-to pasta salad recipe. You know, the one scrawled on a recipe card that you reach for every time there’s a family reunion, potluck or luncheon to attend. The one you can make by heart at a moment’s notice. No matter how much you love that recipe, every now and then you need to surprise yourself and shake up your pasta salad experience. Or maybe you’ve just been making that one pasta salad recipe because it’s the one you know and not because you really like it. Life’s too short to eat food you don’t love. Thankfully, I’ve made plenty of pasta salads over the years that have knocked my socks off and impressed my family. Today, I’m thrilled to share a rundown of the very best pasta salad recipes I’ve discovered. The key to a good pasta salad is the right balance of ingredients. The best pasta salad focuses on simple fresh flavors with as little fuss as possible. I love my pasta salads to be heavy on the veggies with perfectly cooked pasta and just the right amount of dressing. Too little dressing and your pasta salad will taste dry; too much and it gets soggy and unappealing quickly. Sometimes I’m in the mood for a Creamy Pasta Salad with a tangy mayo based dressing. It’s full of broccoli, olives, cucumbers and peppery spices and I’ve served it to both kids and adults with great success. Another creamy pasta salad I can’t get enough of is this Bacon Ranch Pasta Salad recipe. 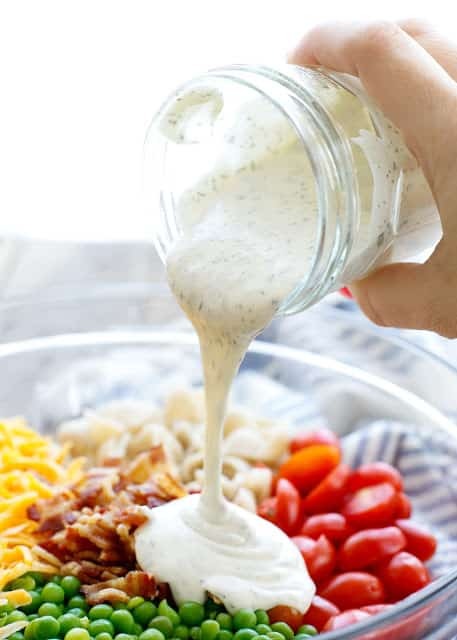 Ranch lovers will go nuts for this easy salad that’s full of crisp pieces of bacon, shredded cheese and juicy cherry tomatoes all tossed together with Ranch dressing. It’s one of those kid friendly meals that adults will be just as excited to eat. Other times, I’m after something a little lighter but still full of flavor like this Italian Pasta Salad. It’s one of the simplest pasta salads you can make and really lets the flavors of the tomatoes, olives, herbs and olive oil shine. It makes sense that Italian pasta salads would be some of my favorite–and some of the most popular. Cold pasta goes so well with Italian flavors of rich extra virgin olive oil, fragrant garlic, herbs, and black pepper. 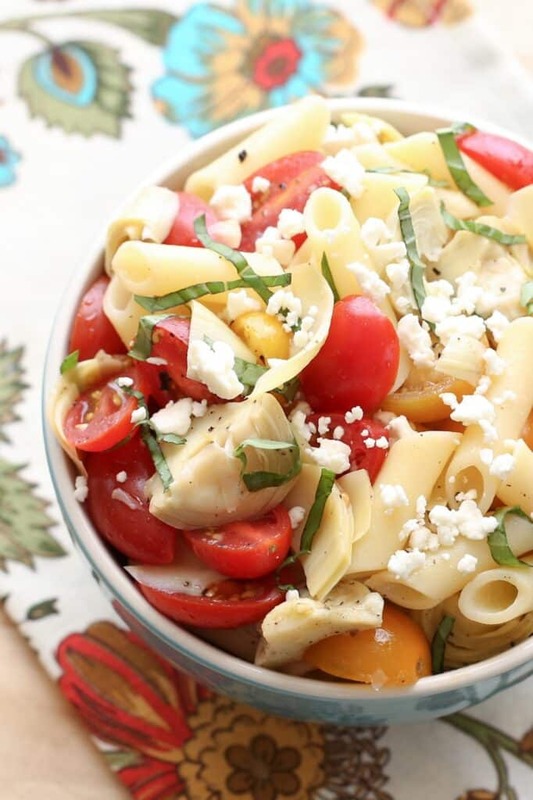 This Italian Artichoke Tomato Pasta Salad mixes glorious Mediterranean flavors with tangy artichoke hearts, juicy tomatoes and fresh fragrant basil. 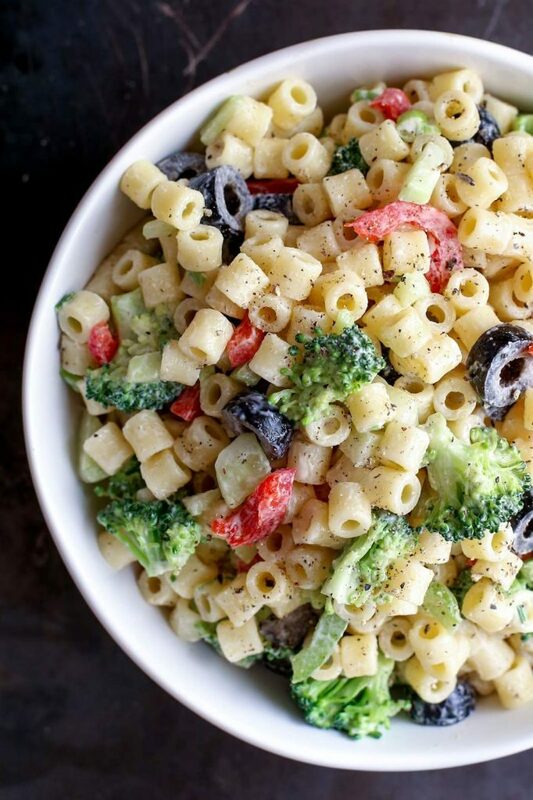 I love mayo free pasta salad recipes because I know I can serve them just about anywhere without having to worry about my pasta salad spoiling. They’re a great choice for an outdoor picnic or barbecue in the hot summer months and allergen friendly because they don’t include eggs or dairy. As much as I love creamy dressings from time to time, there’s something so refreshing about happily eating my way through a bowl of pasta salad where the pasta and vegetable flavors themselves are really on display. Speaking of mayo-free, this Spinach Lover’s Pasta Salad is one of our family favorite pasta salads. Ideal for garlic lovers, I make this salad often to the delight of my whole family. It’s a fresh, brightly colored salad and it always looks pretty when served at a potluck or presented in a big family style serving dish for a quick and easy summer dinner. 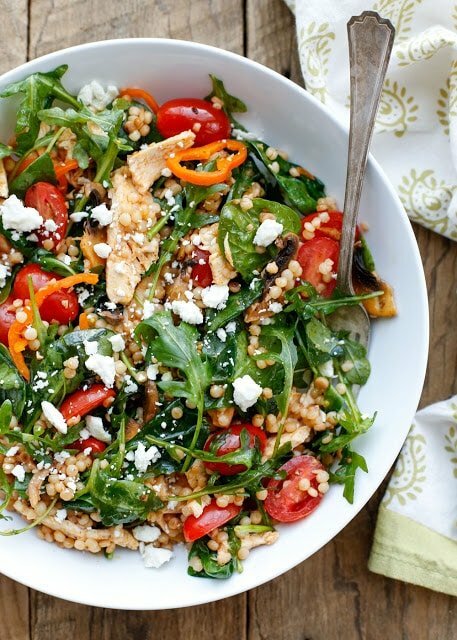 Similar to the Spinach Pasta Salad, this Summer Couscous Salad is one of my personal favorites. I make it frequently, especially in the warmer months of the year which, for us in the Southwest, is most of them. If you’re wondering what a couscous salad is doing on a list of very best pasta salad recipes, rest assured. It may look like a grain but did you know pearl couscous (a.k.a. Israeli couscous) is just a tiny little pasta? Pearl couscous is often sauteed in a skillet for a few minutes after it is cooked in water. This brings out a nutty flavor that is irresistible. If you’ve never tried it before, a couscous salad recipe is the perfect place to start. Couscous pasta salads are also a fun way to change up your pasta salad routine. Tiny pieces of couscous always look fancy and elegant, even though they’re hardly much more difficult to cook than regular pasta noodles! I also really love the texture variety that pearl couscous adds to a salad. Another pasta salad with an elegant twist is this Balsamic Tomato Pasta Salad. I created the recipe several years ago when we had a big tomato harvest that seemed perfect for enjoying in a fresh salad enhanced by tart balsamic vinegar. I use a combination of different tomatoes, including cherry and grape tomatoes, with large pasta noodles and plenty of mozzarella cheese. A dressing of olive oil and balsamic vinegar beautifully complements the bright and tangy tomatoes in this recipe. 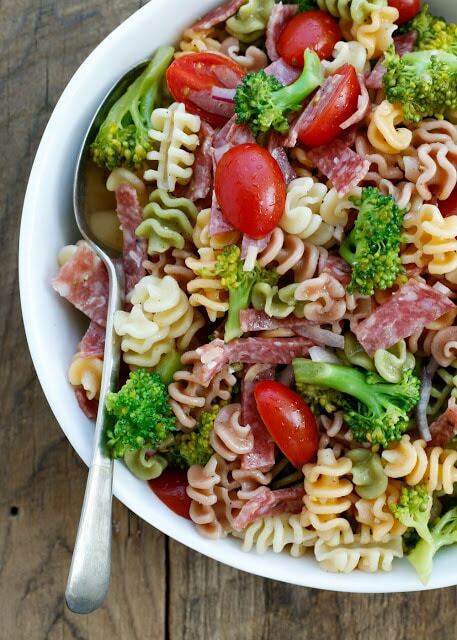 If you love bites of salty salami and crisp broccoli in your salad, you must try Broccoli Salami Pasta as well. It makes for the ideal easy lunch! I’m a huge fan of loading up a pasta salad with as many vegetables as possible, making sure you get a little bit of everything in each bite. This Asian Pasta Salad takes a “run through the garden” as my friend Rebecca says and we all love it. Marinated Vegetable Pasta Salad is paradise for vegetable lovers and especially those of us who can’t get enough tomato goodness in our lives. This recipe was inspired by my borderline obsession with Marinated Tomatoes. Bite sized tomatoes marinated in olive oil, vinegar, spices and just a pinch of sugar become the base and the dressing for this recipe all in one. I can’t mention tomatoes without talking about Champagne Tomato Pasta Salads. Have you ever cooked with champagne tomatoes before? They’re truly delightful to cook with and add an incredible flavor and texture to all kinds of pasta salad recipes. 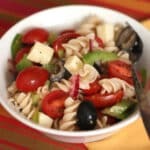 Another favorite pasta salad for those who like to eat the rainbow is this Veggie Lover’s Greek Pasta Salad by Foodie with Family. It’s a colorful combination of fresh raw veggies, Feta cheese, pasta and an herb garlic dressing that’s so good you’ll want to eat it by the spoonful. Have you ever added avocado to your pasta salad? Slices of fresh avocado can add so much to even the simplest of salads and I also enjoy pureeing avocado as a base for dressing. When I think of Avocado Pasta Salad, my mind leaps to Bacon Avocado Pasta Salad. Crispy bacon, ripe avocado and flavorful tomatoes combined over pasta then tossed in a creamy avocado ranch dressing–what’s not to love? Like bacon and avocado, avocado and pesto are a match made in pasta salad heaven. This Creamy Avocado Pesto Pasta Salad by Foodie Crush features roasted vegetables in a smooth avocado dressing with pesto flavors from pine nuts and Parmesan cheese. This Tangy Pasta Salad with Tomatoes, Peppers, Olives, and Cheese was one of the first pasta salads that I learned to make. I watched my sister make a similar simple pasta salad one night while we were visiting and I fell in love with the ease and the deliciousness of a cold pasta salad. With just a few pantry ingredients and a handful of fresh vegetables (if you have them on hand), a simple cold pasta salad is one of the easiest meals we make. Pasta salads can be a satisfying meal on their own or served as a side dish and most pasta salads can be completely customized to your family’s individual tastes and dietary preferences. It’s just as easy to whip up a vegetarian pasta salad as it is to prepare one filled to the brim with bacon. 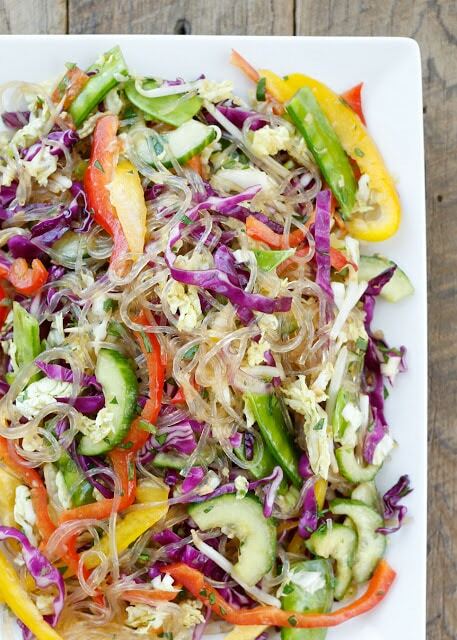 For a gluten free pasta salad, try subbing gluten free noodles or even Zucchini Noodles in your favorite recipe. I’ve been blabbering about pasta salad for a while already and haven’t even mentioned my favorite part of making these recipes: Pasta salads are an ideal make-ahead meal. Most pasta salads take no more than a few minutes to put together but, even so, sometimes you need a quick lunch that you can just pull out of the fridge and eat right away. Pasta salad leftovers keep well for several days. I store my pasta salad in a big plastic storage container in the fridge and find this keeps it plenty fresh. I love the convenience of making a giant batch of pasta salad and then eating it through the week for easy lunches or dinners. If your pasta salad includes an ingredient prone to browning, like fresh avocado slices, you can always mix up all the other ingredients then add the more delicate ingredient right before serving. A meal of leftover pasta salad is always a treat and it’s even easier than assembling a sandwich, reheating soup or microwaving a frozen meal. Hungry kids and teens (or husbands) can help themselves to a bowl of pasta salad when hunger strikes without making a mess. This is our favorite, tangy, mayo-free pasta salad. The ingredients can be easily adapted to use whatever vegetables you might have on hand. Cook the pasta according to directions, removing from the heat and rinsing immediately with cold water until the pasta is cool. Set aside in a colander. Place the onions in a small dish and cover with the olive oil and vinegar. Let rest while preparing the rest of the vegetables. In a large bowl, combine the prepared vegetables, pasta, and cheese. Add the onions with the vinegar and oil and toss well to coat thoroughly. Season generously with salt and pepper. Chill until ready to serve. * If preparing a day in advance, add a splash more vinegar and oil as needed right before serving. ** Any vegetables that you enjoy eating may be substituted for the bell peppers, olives, and tomatoes in this recipe. Just use equal portions to replace them. That is the Broccoli Salami Pasta Salad, Kathy. Enjoy!